A team of competent and ambitious leaders, each of them working hard but somehow there is little synergy among therm and their teams; that is one of the typical situations we encounter. Culture change flows from the top down. We start with the leading coalition of organizations and create leadership team journeys to become more connected with each other, people and ambition. Over a longer period the leadership team spends 1 day per 4-6 weeks on strategy, leadership and team development. Every workshop contains elements of strategic progress ("what have we achieved") and leadership effectiveness ("how did we work together"). This investment in time and attention pays off in improved trust, leadership and collaboration. 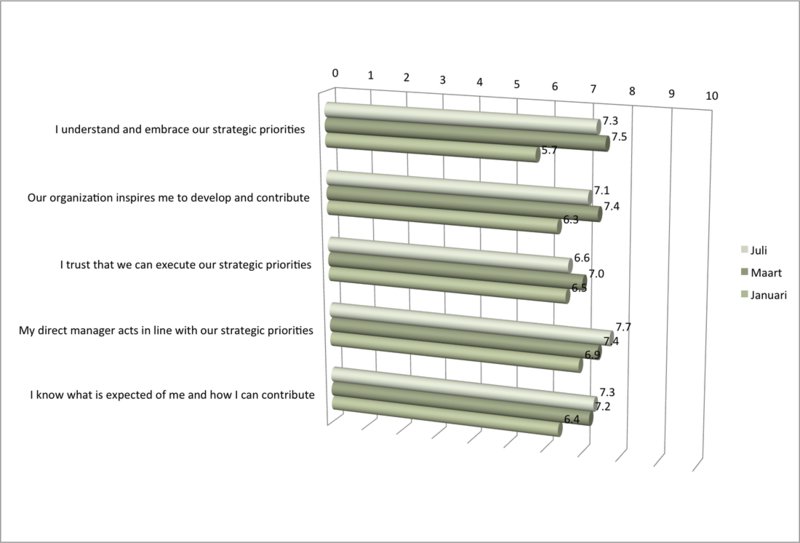 Organizations measure a lot: budget, performance, efficiency, engagement, but usually not strategy awareness. Many of our clients have been triggered to measure strategy awareness and engagement. The outcomes of the measurements are starting points for dialogue and enable managers to adapt their way of communicating, reconfirming and emphasizing messages around strategic priorities and initiatives. The continued attention for strategy awareness stimulates dialogues and those dialogues create awareness and direct energy . Where attention goes, energy flows. People in many organisations are "feedback tired". They do not give their feedback pro-actively anymore because they feel nothing is done with it. We co-create and facilitate continuous top-down and bottom-up strategic dialogues within organizations. We start with surveys and dialogue workshops with all people in the organization to fuel the feedback muscle. Based on the feedback we help design, drive and engage in a continuous cycle of communication and action on the feedback given. The continuous top-down and bottom-up dialogues increase leadership and empowerment on all levels of the organizations we work with. We have talked a lot about "what we want to achieve" (strategy and objectives) and "why we are here" (purpose) and we have achieved quite some results, but we never talk about "how we work together and achieve results" (values and principles). With this in mind we design culture development journeys. The objective of those journeys is creating awareness and commitment for some basic collaboration principles. Based on feedback from the whole organization on perceived strengths and areas for improvement in collaboration and culture, we define collaboration principles, usually with the leading coalition. The collaboration principles need kick-offs, dialogues and repetition within all teams. The impact of these interventions is measurable.